(Newser) – Looks like President Trump won't have to deal with jokes made at his expense at this year's White House Correspondents' Dinner, because the White House Correspondents' Association didn't invite a comedian. 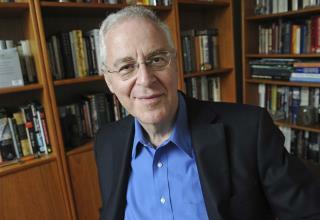 Instead, author Ron Chernow will speak at the annual event, to be held April 27, CNN reports. The historian has written popular biographies of George Washington, Ulysses S. Grant, and others; his book about Alexander Hamilton inspired Lin-Manuel Miranda to write the Broadway musical Hamilton. Traditionally, the POTUS attends the WHCA dinner; he ribs the press and then the comedian ribs him. But Trump has not attended either of the two dinners that have taken place so far since he took office, giving the dinner a more combative feel, association president Olivier Knox explained to CNN. Just Don Henley singing his "Dirty Laundry" song. Now everything will be fine, special, and extraordinarily special now that nobody is being roasted. After the liberal rag they had last year, I'm not surprised. However, this guy is also a Trump hater so there will still be bashing going on but just in a different form.